Maurizio Sarri has denied holding discussions with Roma officials about swapping Stamford Bridge for the Stadio Olimpico. A report in the former Napoli coach's native Italy claimed the Chelsea coach recently met with Roma president James Pallotta and club advisor Franco Baldini to speak about replacing Eusebio Di Francesco. 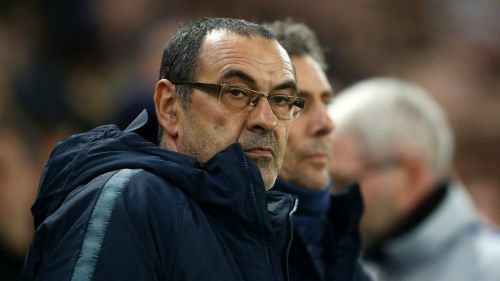 Sarri's future in London has come into question following a poor run of results, while counterpart Di Francesco is facing similar scrutiny amid the Giallorossi's underwhelming campaign. But the 60-year-old this week stated his intention to remain in charge of the Blues "for a long time" and, speaking after his side's victory over Malmo, denied talks had taken place regarding a return to Serie A. "Of course no," he told BT Sport. "Because I have a contract with Chelsea next season, so it's impossible to have contact [from Roma]. "I read something in an Italian newspaper about a dinner with Franco Baldini, but I think Franco is in South Africa so it is very difficult to have dinner with him." Chelsea returned to winning ways with a morale-boosting 3-0 home win on Thursday, which confirmed their place in the Europa League's last 32. Job done at the Bridge. Olivier Giroud, Ross Barkley and Callum Hudson-Odoi all scored after a ponderous first half that did little to assuage the home fans following Monday's disappointing FA Cup defeat to Manchester United. Sarri warned a repeat of the sluggish start would result in a slaughter at the hands of Manchester City in Sunday's EFL Cup final. "It will be a disaster," he predicted in his post-match news conference. "I am worried about the first 30 minutes [against Malmo], [but] only for the offensive phase. We cannot play our football without confidence but the level of application was good. "We are in a difficult moment, we had problems with the fans in the last match so it's normal for the team to enter without confidence. "For playing our football, we need confidence. If we want to be in control and have ball possession and move very fast, we need confidence."